2,000 schools, 600,000 pupils and a flourishing network: The PASCH Initiative is ten years old. Reason enough for the Goethe-Institut and its partners to celebrate and look back at a success story. Johannes Ebert is a little nervous walking onto the podium. Not because of his speech – the secretary-general of the Goethe-Institut has plenty of experience with public speaking. But he promised to drive a round with the PASCH-Mobile, Ebert explains, and he doesn’t have much experience behind the wheel of a mini-van. But the first item on the agenda today is to suitably honour an anniversary in the Hilmar Hoffmann Auditorium at the head office of the Goethe-Institut in Munich. It is the tenth anniversary and the honouree is named PASCH, short for PArtnerSCHools or, its full name in English “Schools: Partners for the Future.” The initiative was launched in 2008 by Germany’s Foreign Office with the aim of creating a worldwide network of schools that promote the teaching of German and convey a modern image of Germany. 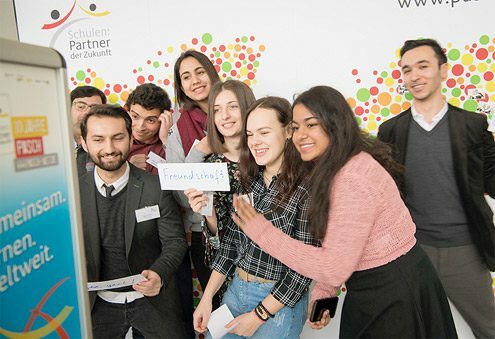 The Goethe-Institut and its partners, the Central Office for Schools Abroad (ZfA), the German Academic Exchange Service (DAAD) and the secretariat of the conference of educational ministers’ Pedagogical Exchange Service (PAD), achieved that aim and then some. We can simply cite a few impressive figures to illustrate the success: The PASCH network presently has 2,000 member schools, 600 of them – in 120 countries – are affiliated with the Goethe-Institut. More than 600,000 pupils are learning German at PASCH schools, that’s five percent of all German learners worldwide. We can also allow those who have directly benefited from this success have their say. A few have travelled to Munich to convey their congratulations on this Friday morning. Ahshok Pandey, for example, the director of Ahlcon International School in India, one of the very first PASCH schools, is here. Pandey remembers how they began ten years ago with 20 German pupils and one part-time teacher. Today, their ranks have swelled to 600 pupils and three full-time teachers. It is quite astonishing how fluent the pupils spoke German after only three years of lessons. The school director has a theory about it: He thinks the Goethe-Institut must have a secret formula for language learning. “The world is wide open to these pupils,” says Pandey. Four of his former protégés are now studying in Germany. One of them, Meghna Sreedar, is here today, as well. The young woman speaks perfect German. She is studying computer science at the LMU in Munich. “I wouldn’t be studying in Germany today if it hadn’t been for the PASCH network,” she says. And when she tells of her experience with PASCH, it sounds like far more than just good language classes. “We discovered a new culture in the classroom,” she says. An opportunity to share: PASCH alumni at the anniversary celebration | Photo: Cordula Flegel Johannes Ebert has some very personal memories of the beginnings of PASCH as well. At the time, he was still the regional director of the Goethe-Institut in Eastern Europe and Central Asia and journeyed to Novosibirsk for the opening of the one of the first PASCH schools. That day, the temperature reached minus 30 degrees – at least outdoors. Inside the school, he was met with a very special feeling of warmth and enthusiasm. PASCH excites people. Maybe that’s the secret formula. Later, he seems to be visibly enjoying himself as he gets behind the wheel of the PASCH-Mobile and drives the van, honking loudly, once around the block. “Next Stop: Bonn” says a sign on the windscreen. Before the end of the year, the vehicle will make stops and present the initiative in 30 cities as a way of launching its next ten years. If you’d like to travel along with it virtually: Hop on!